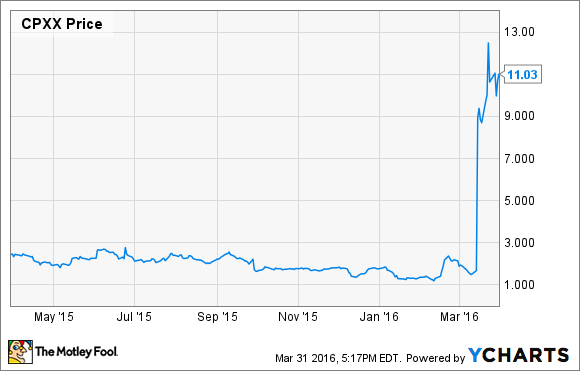 Is Celator Pharmaceuticals, Inc. a Stock Worth Buying? This company may be able to alter the standard of care in the treatment of acute myeloid leukemia. It's been a crazy month for Celator Pharmaceuticals (UNKNOWN:CPXX.DL). After reporting compelling late-stage trial data for its lead product candidate, Vyxeos, shares more than quadrupled. Management followed up that news with a stock offering that shores up its balance sheet, but is Celator Pharmaceuticals stock still worth buying after its big run higher? Let's take a closer look. Doctors have used the commonly used chemotherapy drugs cytarabine and daunorubicin to treat acute myeloid leukemia (AML) and other blood cancers for the better part of three decades. The two-drug chemotherapy cocktail is commonly referred to as "7+3," because cytarabine is dosed during days one through seven and daunorubicin is dosed during days one through three. The efficacy of the 7+3 approach stems from pre-1985 studies the Cancer and Leukemia Group conducted. Since then, attempts have been made to improve upon efficacy by adjusting this dosing schedule. However, these attempts have fallen short. For instance, a 10+3 combination didn't improve upon 7+3. Additionally, researchers have attempted to fine-tune dosing by adjusting the size of the doses, replacing duanorubicin with other agents, and adding additional drugs to the cocktail. Although these efforts have shown some improvement in certain patient groups, generally, treatment with the 7+3 standard of care fails to secure long-term remissions, and as a result, the five-year survival rate for roughly 20,000 Americans diagnosed annually with AML is sadly just 25.9%. Unquestionably, new treatment approaches that deliver better outcomes are necessary. Earlier this month, Celator Pharmaceuticals reported data from a phase 3 study of a novel combination of cytarabine and daunorubicin that suggests it may be able to improve those survival figures. The company's researchers developed an optimized 5:1 synergistic ratio of these two drugs that's delivered in a liposomal formulation and that appears to work better than the 7+3 standard of care. In a phase 3 trial involving 309 patients, the overall survival of secondary AML patients receiving Vyxeos was 9.56 months. That performance was far better than the 5.95 months for patients receiving the standard 7+3 regimen. Following those results, management plans to file Vyxeos for FDA approval in the third quarter, and then it plans to follow up that filing with a filing in the EU early next year. There's little question that the patient need in this indication could lead to substantial demand for Vyxeos. However, one knock against the company -- until now -- has been its balance sheet. The company exited December with $23 million in cash on hand, and even after adding another $9.8 million via an at-the market stock offering earlier this year, management's guidance was still for its cash stockpile to run out around the middle of 2017, which is just about when the FDA could issue a decision on Vyxeos' approval. Given that drug launches aren't cheap, the company's cash position raised some questions. Fortunately, the company erased some of those concerns by pricing a 4 million-share offering at $9.50 per share this past week. Investors oversubscribed to that offering, and as a result, the company was able to add an additional $40.6 million to its balance sheet, after fees. Although that offering dilutes investors, a negative, it also eliminates an overhang that might have otherwise kept some investors from buying ahead of a costly product launch, and for that reason, it was the right move. Given its late-stage trial success in boosting overall survival -- the gold standard of any cancer study -- it would seem that Celator Pharmaceuticals has indeed built something that could significantly improve the standard of care and, in turn, make this company one worth watching. However, investors might want to keep some of their enthusiasm in check, at least until we get more insight into the efficacy of next-generation immunotherapies that are being developed for the indication. Juno Therapeutics (NASDAQ:JUNO) is conducting a phase 1/2 study of its JTCR016 in AML, and results from that trial could be available in the first half of next year. Also, Kite Pharma (NASDAQ:KITE) has teamed up with Amgen (NASDAQ:AMGN) to discover next-generation immuno-therapies that could be used in AML, too. Juno Therapeutics and Kite Pharma's efforts are admittedly in the earliest of stages of research. Thus, Celator Pharmaceuticals could have some running room that makes it appropriate for risk-tolerant investors. Nevertheless, investors will want to keep a close eye on Juno Therapeutics and Kite Pharma's progress, because their immuno-therapies could challenge Vyxeos in this indication someday.